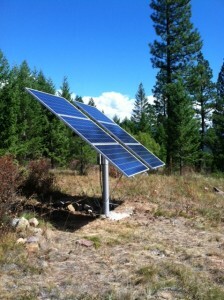 6-panel pole-mounted array, part of a grid-tied, battery-backed solar PV system in Nine Mile Valley, Montana. 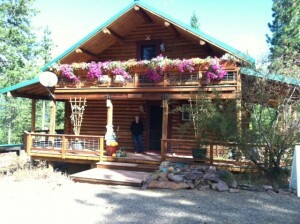 This summer they suffered a lightning strike making landfall on two Ponderosa pines some 40 feet from the solar array. The surge of electricity blew the bypass diodes on the modules and the controller on the propane generator. Fortunately, it did not affect the batteries, the inverter or charge controller. Since we now had grid power to the site and we were replacing equipment anyhow, the owners decided they wanted a grid tied, battery based inverter installed. This gives them the best of all power worlds in that they have batteries for emergency power and can also sell back excess power they do not need. Remember, standard off grid battery based systems receive a huge variation of power between summer and winter. In winter our light levels are low to where we can easily use all the power our solar arrays generate. Unlike summer when most off grid systems completely charge the batteries by early in the day and the solar modules are effectively turned off for the balance of the day. Not so when we include a grid connected inverter in the system. With this addition we can keep the modules operating at full generation and send this power back through the electric meter, creating credits for later use. This in effect, gives us the benefit of annual storage of our solar power, something that solar enthusiasts have dreamed about, especially those who live in the Northwest where we have huge variations of insolation through the year.